Download and install the MiniDLNA Add-On. 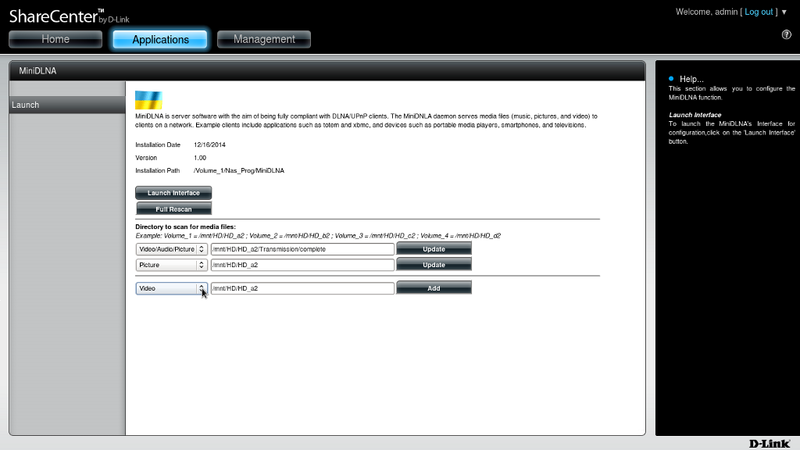 Click the link for the MiniDLNA web interface and configure it. Can I use this software without the fun plug? Yes - no funplug needed, working great! Thanks a lot for your answer. But as I "messed" my RAID1 construction (I just see a Volume_2, so everything thing is on hd_b2), I can't run and use FFP (he need to be installed on Volume_1). How may I access to /mnt/HD/HD_a2/Nas_Prog/MiniDLNA/web/MiniDLNA_sub.php without SSH/Telnet as I can't activate it through ffp. Is there an other way to reach this location ? It works ! The utelnet addon I mean . But even after replace hd_a2 per hd_b2, it didn't show any php error but the server didn't launch, so after quick check in sh files, nearly everyone as a hd_a2 in it, so I decided to stop all this and break the raid1. is m4b file format supported? i have some m4b files and it's not showing up in the client. otherwise, the minidlna addons works like a charm. thanks.